Concurrently with our book writing and publishing activities particular attention has been paid to setting up our own CD and video production. In an age when the application of electronic media devices is insistently increasing we resolved that it was compulsory for us too to commence a production that renders such countless new possibilities for presentation, representation and communication. Our first multimedia production was the edition interrelated with the book The Jewish Community of Zemun 1739-1945. This novel manner of presentation advantageously facilitated a bilingual edition of the book (Serbian/English) and a CD storing more than double the number of photographs contained in the book plus a valuable documentary film about Jasenovac. 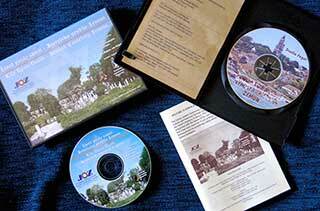 The multimedia CD, the Meeting of Small Jewish Communities in Subotica-2007 was our first attempt to augment a form of gathering that ought to represent a new approach to developing cooperation between local communities. The two exhibitions about the various activities of the Zemun Jewish Community covering the period from 2000 to 2008 were made available as DVD films. Our next significant project was the multimedia CD production about the Jewish cemetery in Zemun titled LIFE UPON DEATH. The multimedia CD containing a documentary film featuring our cemetery has become a major input to the tourist itinerary of Zemun. Currently our latest accomplished edition is a release covering the Second Regional Conference of Jewish Communities Hódmezovásárhely - 2008 held in Hungary. All issues mentioned above are available against modest donations as compensation for our effort.